Impulse buying rigid heddle looms is just one of the things that happens at Sheep Cabana. Last summer,I was out in Cambria, Calif., and stopped in at Ball & Skein. The store is chockablock with gorgeous fiber that I could barely resist, but I did. Instead I walked out with a 15″ Schacht Cricket rigid heddle loom, which I brought back with me to the UK. I have used the loom a few times and have been muddling along with it–not making any serious improvement to my weaving skills. Then I came across a new book Woven Scarves by Jane Patrick and Stephanie Flynn Sokolov and published by Interweave. Full of beautiful projects and easy-to-follow instructions I felt more confident to try this log cabin scarf. The plan was to spin some of my newly acquired and stashed heritage- and rare-breed fleece to create this beautiful log cabin weave. The log cabin pattern, I thought, would be great to show off the rare and heritage-breeds’ natural colours. 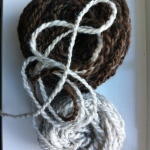 One of the great features of Woven Scarves is there is a scale (actual size) photo of the commercial yarn used in the sample scarves alongside the instructions. 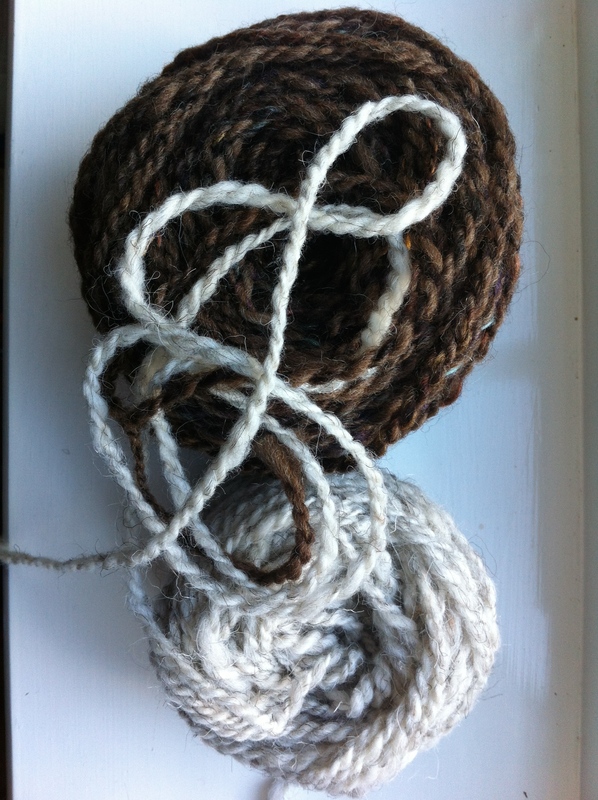 When I went to spin 200 yards each of Shetland Moorit (chocolate brown) and North Ronaldsay (white, specks of grey), I kept the book to hand and referred back to the pictures every so often to check the yarn thickness. 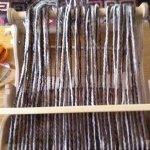 I did blend some darker Shetland roving with the Moorit that had flecks of dyed silk in it. 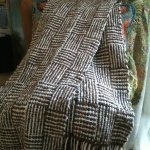 It gives a subtle effect in the finished object–just little bits of color. The instructions for this project recommended using the indirect warping method. This requires a warping board, which I made out of some pvc piping. Honestly, I should have just bought a warping board. No matter. Warping the loom was probably the trickiest part of this project for me. 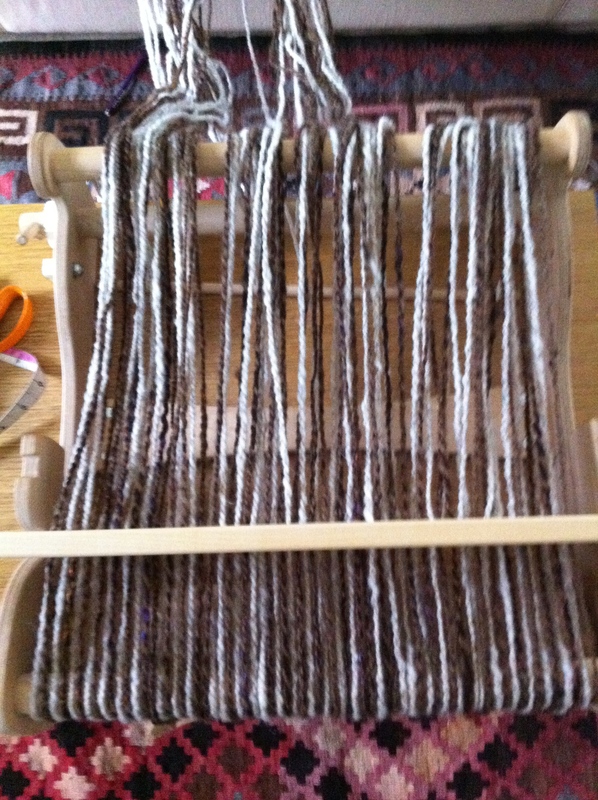 There was some considerable faffing with the warping board as I figured out how to use it. Once I got the loom warped it was smooth sailing. Log cabin weave is a simple block plain weave. 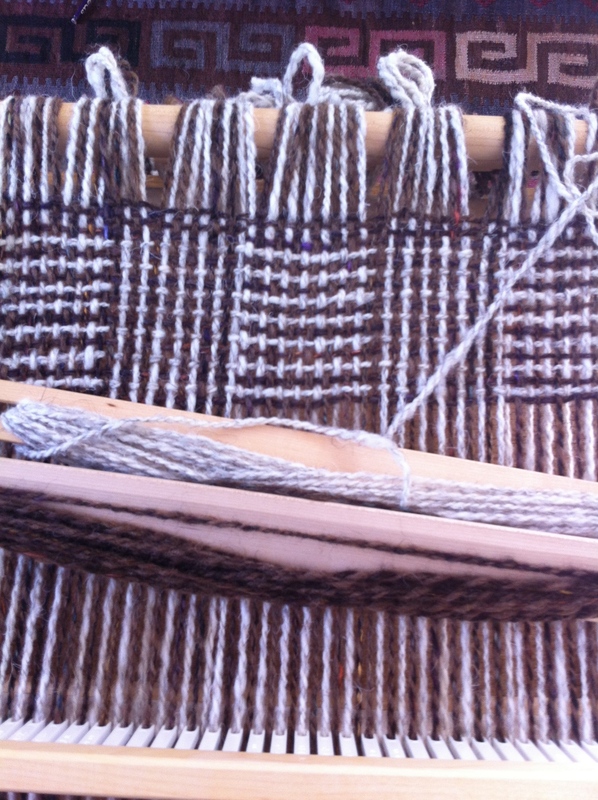 The pattern comes from the way the loom is warped (for example, light, dark, light, dark, then dark, light, dark, light, etc) and then woven alternating dark, then light, until switching to light then dark. 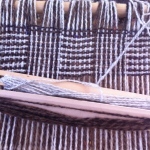 There’s no call for pick up sticks or any of the other techniques you can use on a rigid heddle weaving. However, it’s important to remember that before you go zooming off to weave yards and yards of fabric–you must hemstitch the beginning of the fabric and repeat the process at the end. It makes life a lot easier. 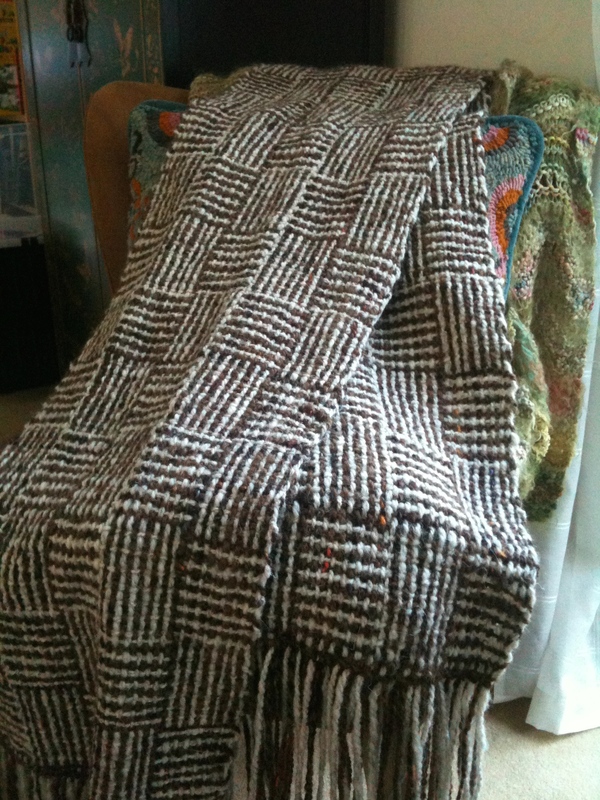 Next up in weaving: Attempting to sew a garment (or bag) out of handwoven fabric.